Lollapalooza promoter, Chicago Park District is still assessing conditions. Sunday showers caused a muddier Lollapalooza this year, and event organizers say the turf took more of a beating than in 2013. As in year's past, festival promoter C3 Presents is on the hook for the repairs. In 2011, the company spent more than $1 million to the Chicago Park District to restore Grant Park. 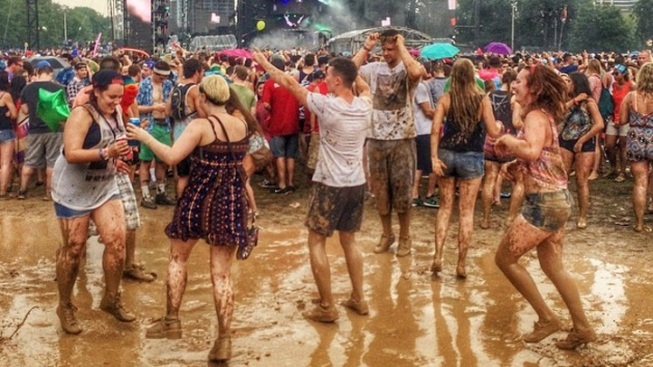 8/3/2014: Lollapalooza fans got muddy after Sunday showers drenched Grant Park on the final day of the festival. In 2012, the tab was $350,000, about $200,000 more than originally estimated. Park district officials say C3 has rented Grant Park for the next four or five days, and won't be able to assess the damage and the repair work timeframe until after they're all out. Sections of the park likely be cordoned off for the rest of the summer in order for the restoration work to be completed, including mulch removal, soil placement and allowing time for the grass to grow again. The Chicago Park District gets a guaranteed minimum of $1.5 milliion from the festival, based on a percentage of ticket sales each year. A majority of the streets closed for the festival will reopen by Wednesday.